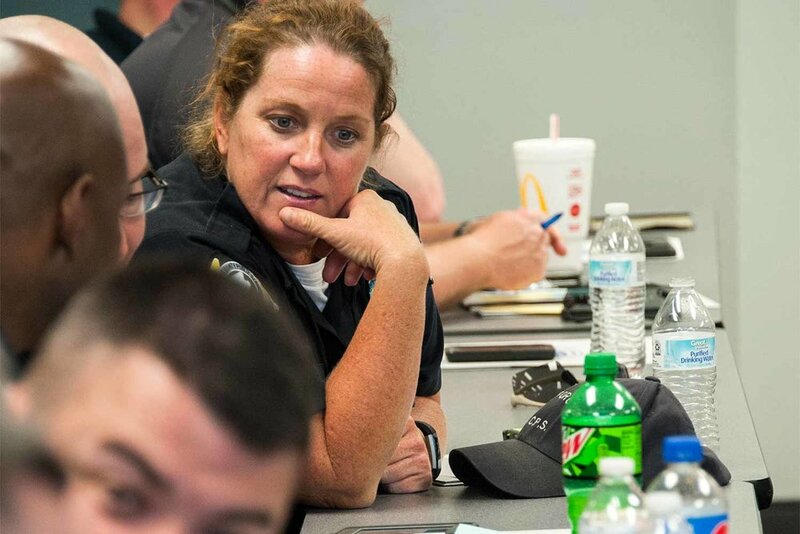 The Kentucky Law Enforcement Trainer’s Association was established last month by trainers and leaders from around the commonwealth looking to improve communication and training in law enforcement. More than 100 trainers and law enforcement executives attended the first Kentucky Instructors’ Conference, hosted by the Department of Criminal Justice Training. The conference was conducted to discuss the possible formation of an association and hear from leaders of the Tennessee Law Enforcement Training Officers’ Association, which has been established for more than 30 years. Dwight Williams, director of the Cleveland State Community College Law Enforcement Training Academy and 19-year TLETOA member, and Lt. Bobby Anderson, Roane County (Tenn.) Sheriff’s training supervisor and 21-year TLETOA member, spoke about the details of their organization and how it has grown to include more than 400 members. “The objective is to bring together law enforcement training leaders from across the state to exchange information and ideas, and to bring the best training to these officers to take back to their agencies,” Williams said. The strength of the Tennessee organization is in the networking of trainers, Williams said. Trainers from all regions of the state are able to call others to exchange lesson plans, get help with issues and put a face with a name. With help from the Tennessee organization, Henderson Police Sgt. Jeff Welch said Kentucky will be ahead of the game because TLETOA has provided the road map to a successful organization. Welch’s father has been involved with the Tennessee organization for 30 years, he said, and bringing the organization to Kentucky has been a dream of Welch’s. A steering committee was elected during the conference to begin laying the foundation for KLETA. Dividing the state into four regions, the following leaders were elected to serve in the interim. DOCJT Instructional Design Training Instructor Gina Smith, who helped coordinate the instructors’ conference for DOCJT, said the steering committee will begin planning for a future conference, during which time more permanent board members will be elected. The steering committee also will include representatives from each of Kentucky’s four law enforcement training academies, and those requests already have been made. Those interested in getting involved with KLETA should contact the steering committee member in their region. There will be different levels of membership, and both instructors certified by the Kentucky Law Enforcement Council and those who are not will be invited to participate.